There’s something immensely satisfying about cooking your whole meal in just one pan & having little to no clean-up. One pan cider pork ribs & autumn veggies is just the thing for the harried cook who doesn’t have the time nor inclination to stand stove-side while preparing the evening meal. 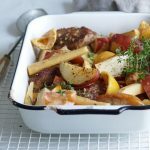 After browning the pork in a roasting pan, I tossed in parsnips, wedges of red potatoes, lemon pieces, a handful of fresh thyme & rosemary then drenched it all in fresh apple cider. 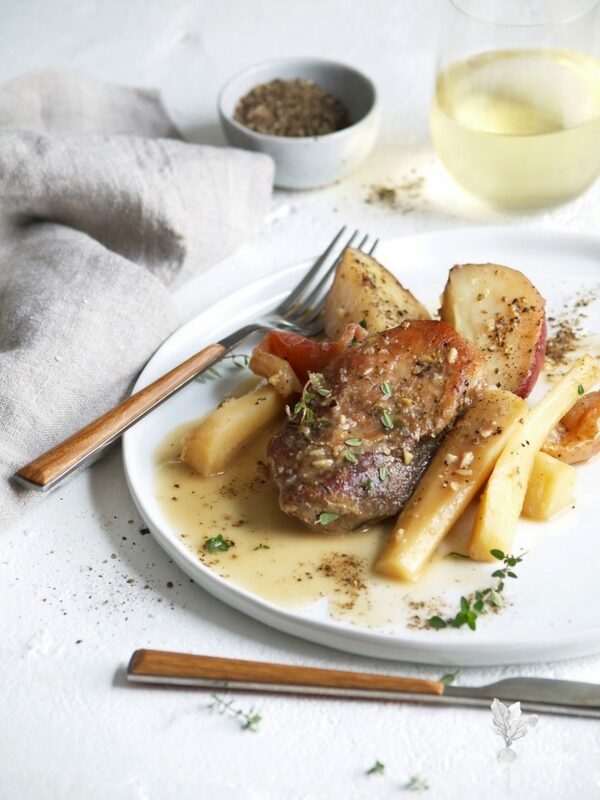 As it cooks gorgeous autumny smells punctuate the kitchen making you want to cozy up with a good book in front of a roaring fire, then it’s time to throw in the apple wedges. It’s ridiculously fuss-free. Parsnips remind me of my Nana. I love them because they have a rustic, old-world quality about them. I think they’re quite under valued, paling, quite literally, in comparison to their cousin the carrot. 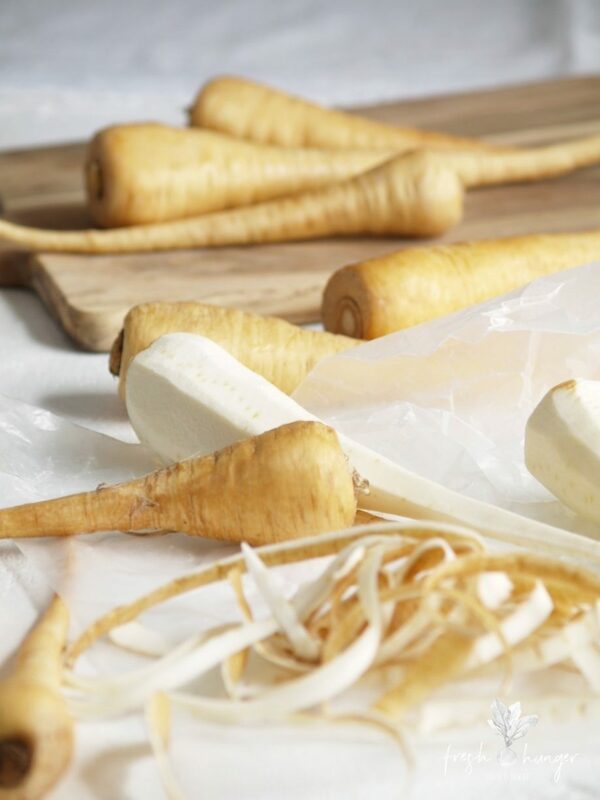 Parsnip are a good source of fiber, excellent for your digestion & overall good gut health. They’re loaded with Vitamin C – one cup containing almost 40% of RDI, yet containing only around 100 calories. They’re good for your heart & can have quite the impact on keeping your cardiovascular system healthy. For those of you who cook any of my recipes you might have noticed I love to cook with fresh herbs. Fresh herbs can elevate any meal. 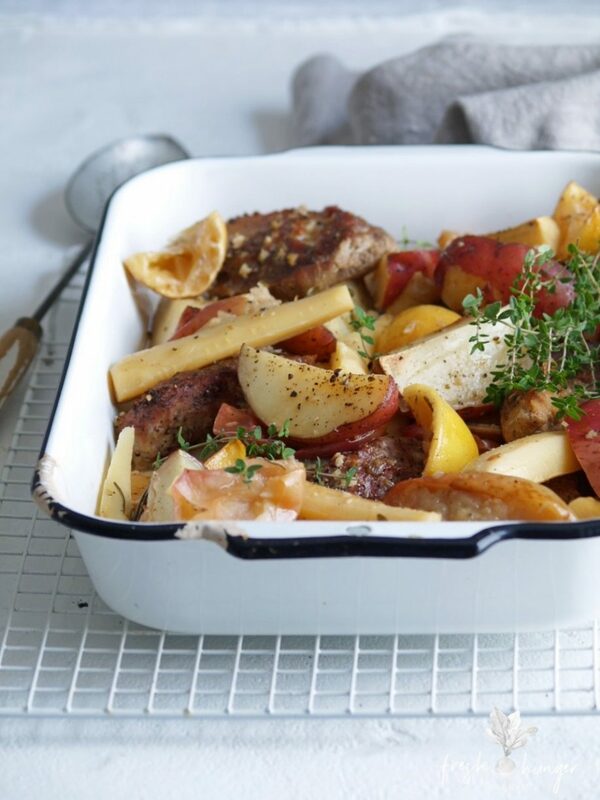 One pan apple cider pork & autumn veggies has generous amounts of rosemary & thyme. These woody, aromatic herbs can withstand a longer cooking time not losing their flavor & work just brilliantly in wintery meals such as stews, casseroles, pot roasts & braises. Serve this simply as is, or if you insist on seeing some green, I suggest some roasted Brussels sprouts or even some frozen green peas thrown in, in the last few minutes of cooking. Or some simply dressed salad leaves to serve alongside. Remember, the premise for this wholesome, warming meal is its simplicity. Until next time, cheers! Heat olive oil in a flameproof, ovenproof large roasting pan over medium heat. Season the flour with salt & pepper & toss pork in the flour mixture. Cook the pork about 5 minutes on the 2 largest sides until browned. Remove from the heat. Add thyme, rosemary, garlic, lemon, parsnips, potatoes & apple cider. Roast in preheated oven, uncovered for 30 minutes. 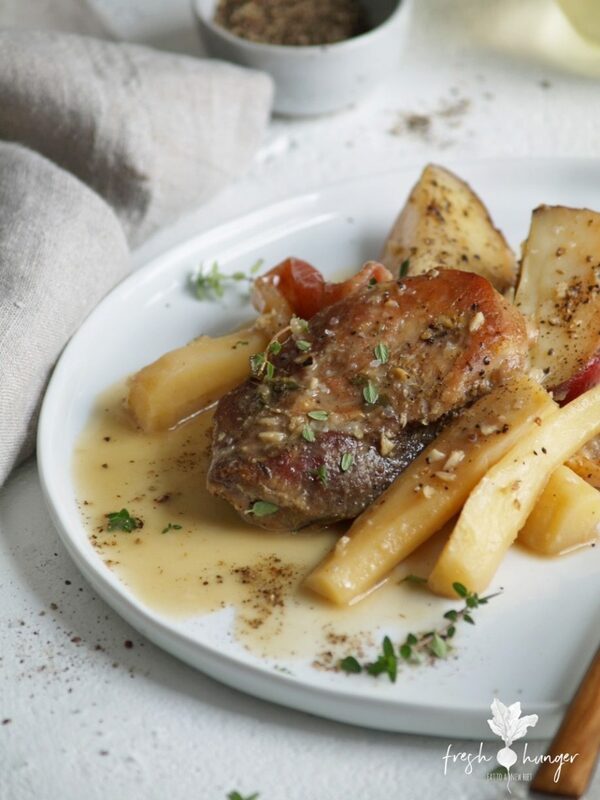 Add apple & roast a further 15 minutes or until pork is tender & apple & vegetables are softened, stir once or twice during cooking. 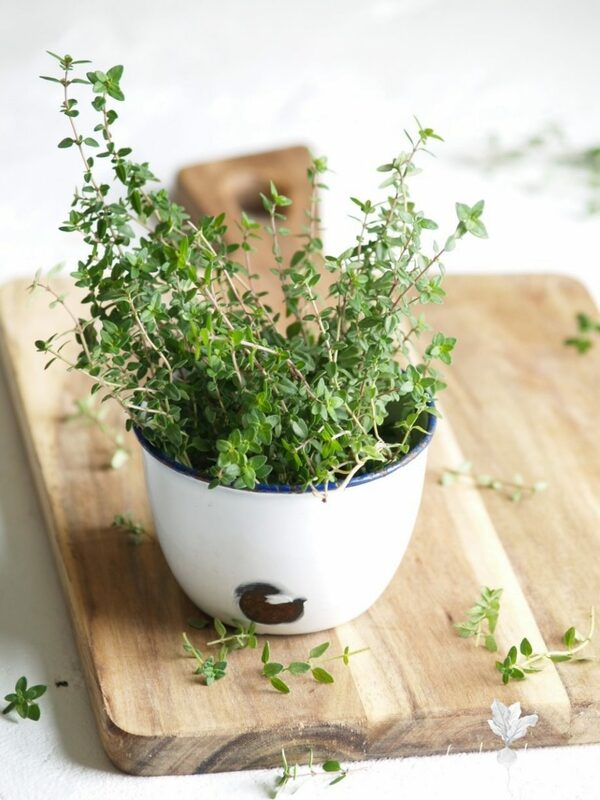 Remove thyme and rosemary stems before serving. Serves 6.